This herb has a peppery flavour with a slight hint of vinegar that is suited to vinegars and fish, but it also has many other uses in the kitchen. It is originally from southern Russia and western Asia. Tarragon has few medicinal uses, but does have the peculiar property of causing slight numbness of the mouth when the leaves are chewed. It is an aromatic perennial that is native to Siberia and the Caspian sea area. Tarragon enhances the flavour of many foods, but can become overpowering if used excessively It goes well with fish, pork, beef, poultry, game, potatoes, tomatoes, carrots, and most mainstream vegetables. It also goes well with lemons and oranges. 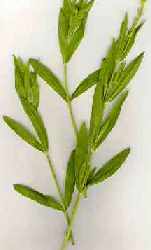 Tarragon can be used in cream sauces, herbed butters and vinegars, soups, sour creams, and yogurt. Well drained soil, in sun or partial shade. Tarragon prefers well-drained soil which is not too high in nutrients. It will do equally well in full sun or partial shade. Start the seeds off in pots around April time. Sow four or five seeds per pot in moist potting compost covering them with compost to exclude light. Keep them indoors at room temperature. When the seedlings begin to show, move them outside, out of direct sunlight. Thin them to one seedling per pot. They are ready for planting in their final position outside when the seedlings are 10cm (4in) high. French tarragon cannot be grown from seed as it reverts back to the Russian tarragon, so it needs to be propagated from cuttings. If you are growing tarragon from seed therefore your only choice is Russian tarragon. This is a pity because French tarragon has a superior flavour. If you want to grow French tarragon, buy a small plant from your local nursery. Dig the soil well before planting and add a handful of bonemeal per square metre (yard) at the same time. If the soil is not well-drained dig in as much well-rotted organic material as possible to open up the soil - alternatively obtain a small amount of sharp sand from your garden centre and dig that well into the soil. Plant as normal, ensuring that they are watered if the conditions are dry. Choose a position where they can remain undisturbed for two or three years. Tarragon is not a particularly attractive plant, so consider this when choosing a position. Mulching with organic matter in October will help them over winter if your area has particularly harsh winter weather. Tarragon can be grown in containers for two or three years with no special care - water and liquid feed a little less than normal. They can also be over-wintered indoors if you have a sunny windowsill, but as mentioned above they are not attractive plants. One plant should be enough for a normal household's requirements. Best used fresh or from frozen, just snip off a piece whenever needed. If you want to freeze a lot of tarragon, the best time to harvest it is in July or early August .